24-7-365: Lavish me with praise. Sometimes, you just need to be honest about what you need, right? While I didn't slave over the girls' Valentines like some people, I did make them myself. It was as simple as getting a picture of the girls with their hand in a fist outstretched. 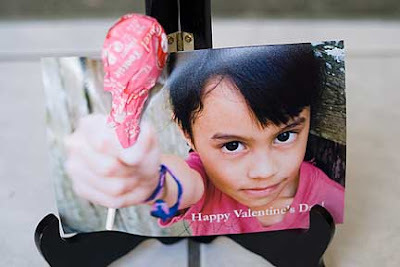 Overlaying some "Happy Valentine's Day" text in Photoshop and having them printed as a 4x6. Then I simply cut with some sharp-pointed scissors, a slit at the top and bottom of their hand and slid the sucker in. I also used a piece of scotch tape on the back to make sure the Tootsie Pop didn't fall out. Done. Total time spent, maybe one hour? Love it!! I might be stealing your idea for next year!! Those rock. If my kids could give out candy we would copy you. but they can't. So they get to give out the boxed crap. awesome! such a great idea. Fantastic! I bought cards this year, like always :P.
That is a totally awesomely awesome idea. I'm stealing it. That is totally awesome! How original! Just took pictures of my kids and am TOTALLY stealing this idea. LOVE it. I freaking love these! Nicely done! Okay. Just ordered my pictures and will pick them up at Sam's Club in an hour. I freaking love you right now. I'll be sending readers your way for this idea. Thanks a million! A fantastic idea and brilliantly executed! What an excellent idea. I am totally copying this one next year. Praise! Praise! Praise! These are such a clever idea. They will be the hit of Valentine's Day at school! What a great idea! They look awesome! OK, I'm bowing down to the master of valentines. I'll have to remember this when I have kids and have no creative ideas. You're soo good at this kind of stuff. Looks Rad! you totally deserve praise ... hmmm wonder if I have time to lift this idea! :) SO SO CUTE! best Valentine I have ever seen! I totally slaved over mine and wish I would have done this. Next year for sure. we aren't allowed to do candy, but I'm going to try it with pencils instead. Thanks for the great idea! I totally copied you. Hit of the playgroup party for sure. how clever are you! I love this idea! I just happened across your blog and think it's lovely. I love your photography and obvious love for your children. And what a great valentine card idea! that makes the valentines hall of fame! Super cute! Going to steal your idea for next year! K, these are so cool!! I must feature these!! you've got the smarts. and thanks to you, after i complete this project, all the moms in preschool (as well as the teachers) are gonna think i have the smarts, too. Can I post this idea (and a photo of it) on my blog along with a link to you? I LOVE it!! ok. so right after my first comment, i went ahead and made this card. it is awesome. and when i say awesome, i mean awesome. also. i may have to buy another bag of tootsie roll pops because i may or may not have eaten too many. Can I post this on mypetitepurse.blogspot.com with one of your pictures? I am trying to find inexpensive and fun V-Day gift ideas to post and this is perfect. Come share your totally neat picture idea at my party: Thursday's Treasures! I have to try these! thanks for the idea! I'm blogging about you and totally stealing this idea. Wow! I have seen similar projects involving fake flowers, but this is just awesome! I am so making these this year. Valentines are always a fight!! This is so much better! I am here to lavish you with the PRAISE you deserve! Those valentines ROCK!! I am filing this at thecraftersfilebox.com. WOW! I love this! Genius! This idea is completly awesome. I have a perfect idea for my daughter picture in her valentine tutu and this tutorial.....Thank you so much for the idea. You totally deserve to be lavished with praise! These are so fantastic and creative!! GENIUS! Utterly genius! What a great idea!! These look amazing and I am so on board with with the simplicity factor!!! WAY TO GO! WOW, that are extremely cute! I might have to try that. Bravo! Uber cute ~ thank you! I borrowed your idea but gave you credit on my blog. Thank you!!! ADORABLE idea!!! I LOVE love LOVE this idea!! My girls have a Valentines party to go to in a couple weeks and I couldn't think something up, last year we did a sucker thing as well, but put heart shapes around a sucker so it looked like a flower. Brilliant I tell you, just brilliant!! That is amazingly cute! I am going to link it from my blog tomorrow so that my readers can see it! I LOVE IT!!! I am going to copy you and do it too. Thank you so much!! So, I am blog surfing and I see these cutie pictures with two little girls, and I ask myself, why do they look so familiar? They are your girls and you are web famous - did you see http://kari-youcanmakeit.blogspot.com ? Congratulations on being fabulous!!!! I just came across these via Crap I've Made. I love them!!! This has got to be the most creative valentine card that I've seen. Wow! Thanks for sharing. You are so creative!! Love this idea and will be doing a photo shoot with the little one today....if shes in the mood! Just found you, nice to "meet" you. These are so great! I can't believe how creative and silly and fun they are! I found you via Ucreate - thanks so much for the great Valentine idea! I've included it in a post on my blog about making your own - thank you! Love this so much. And can't wait to give it a try. What a wonderful creative card. I love it!! My boys will enjoy passing these card out at school! thank you so much for this awesome idea! i found you through U-Create, and created these myself with my little guy, I'll be posting them on the 14th, and linking to you, of course! These are adorable! So creative and unique. I am featuring this on my blog. I LOVE this idea and have already made it for one of my boys! I posted a pic of the sample one that I made on my faceook and everyone loved it! I shared a link so they could find it too. Thank you for sharing your creative ideas!!! You are so creative and I LOVE it! Thank you Thank you Thank you!!! Fanasic...off to take a picture of my boy right now! Thanks! Thanks for the great idea. Everyone who has seen them loves them! LOVE that idea!!! Mind if I copy? Genius! Yep, I sure hope u gave us permission to use this idea, cause I'd like to have these printed up tonight! What an amazing idea! I might turn that one into my son wearing his incredible hulk costume with the big giant hands - it would be really funny and right up his little six year old boy alley. So great! Just posted this on kirtsy. Found this via Ucreate! Awesome idea, I had to copy.... I linked back to you on my blog! I'm lavishing you with the highest form of flattery - I copied and stole your idea for my kids' Valentines! I posted pics to my friends facebook page and put your link up for people to check out. They are so adorable!! This idea rocks!!! Fabulous!! Totally sending you readers!! I saw these on Crap I've Made and wanted to come over here and give you a big THANK YOU for the great idea ... I sent them off to school with my crazies this morning!!! Oh I am so doing this! Thanks for such an awesome original idea! Hey Alissa, I copied you this year. Apparently, half the kids at the school are doing the same thing. Yer so popular! Absolutely love this! What a cute idea! Looks like they are all over the blogs now! Fun! RAD!! I love the idea, totally going to copy you!! Thanks for sharing! Too cute! I'm going to link you to my blog. Hope you'll do the same. THIS SUCKER VALENTINE IS SO DANG CUTE! I saw it on NANNY GOAT, I had to make them for my sons class!! Thank you. most darling idea ever! really. I just saw these on Design Mom and they are about the cutest, cleverest idea ever. You're brilliant! holy cow this is such an awesome idea. I AM SENDING YOU ALL THE PRAISE I HAVE! Your idea was amazing and I just posted our version of your cards on my blog. Followed one blog, and she followed you. I came by to say thank you for sharing this dear Valentine. We made two versions and now my happy children are passing cute-clever Valentines. 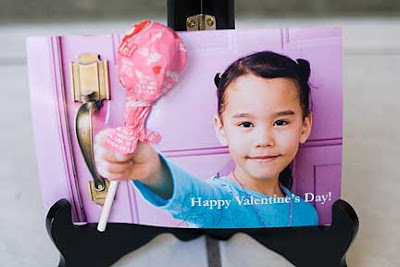 Posted up your CUTIE PATOOTIE Valentine's on my blog today!! I lOve this!! I have posted you up on my blog!!!! BRILLIANT! Simply brilliant! Where did you get the inspiration to come up with such a clever idea? Very cool! Thanks for the super cool idea! Love it & we just had to make some, posted about here. Where was this when I was slaving over my son's Valentine's cards a few days ago?! Great idea! I lavish you with praise this Valentine's Day! Genius! found you via kirtsy (and now about 3 other friends who also used your idea) and I just wanted to thank you. I love the way they turned out and it was easy and fast. These were a huge hit with at my daughter's school! I linked back to you from my blog. Thank you so much for the fantastic idea! Lavishing you with praise and internet cookies. OK, my funky Thank You notes for my forthcoming Wedding are now all sussed. I'll just cross that one off the list! All praise and honour and internet good-tidings belong to YOU! I have run into this post from another blog I follow and am totally captivated by this. I am obviously too late for v-day but I think these would also be an awsome end of the year little gift to hand out to the kids in my son's class and teachers. Thanks so much for this super intuitive idea! This is so cool i will do it for sure!!! after i will send you the pictures!!! definately going to share this with all my MOPS friends. What a creative idea! Absolutely AWESOME!! I am definitely stealing this!! Wow! This is a brilliant idea! Love it! This will be awesome! I'm doing a profile shot of her blowing bubble and will put the wedding bubbles in place of the candy. SCORE! Thanks for sharing. As all the others have said before -this is such a great idea! Really made me smile. Well done! I not only LOVE this idea and plan to steal it, I'm doing so IMMEDIATELY!! I did this two years ago and plan to do it again this year. Fun and pretty cheap if you get prints on sale. saw this on pinterest and I'm totally stealing it! Thanks so much! Best. Idea. Ever. Gonna steal it. Just sent my shots to be printed. Love this idea!! Thanks! Thanks for the awesome idea. I took one of my son in front our red door. I'm going to put a heart shaped lollipop for his preschool mates and a red rose (fake) for his 2 teachers. It's a great idea for Christmas as you can use a candy cane or Christmas pencil. Thanks again. will do again next year when he's in Kindergarten. I love, love, love this idea and have been waiting to make them for my daughter. :) I posted the pictures of the ones we made on my blog today with a link to your post. Thanks! totally love these and completely copied them for my son's Valentines this year. Showered you with lots of praise over on my blog It's Toile Good with lots of link love! These are amazing! I am so keeping these on my list for next year! Thanks for the great idea! Love your idea and tried my own spin...left you some love on our blog with your link too. Your blog is awesome thanks for sharing your wonderful ideas! That is the GREATEST thing I've seen in a long time! Wow! COolest thing ever! You've saved my life, I love it! This is a fabulous idea. It will be great to use Granny's picture and give it to my grandkids. This is AWESOME! Just sent it to my kids to try with their wee ones. Would work well as a birthday card too! GREAT idea. Thanks so much for a great idea!!! Love your blog!! This is incredible! I, too, will be using this idea next year. I found you through a friend of a friend. Thank you for sharing your genious! love the idea- hate the candy- going to use flowers and do this for easter cards!! Thanks a million!! My first-grader and I did this for her Valentine's party at school and it was a hit! No one had ever seen this sweet idea before. Thank you, thank you, thank you for sharing. Just made a similar card for a birthday invitation - thank you so much for such a wonderful idea!! I just ran across this site with stumble. I love this idea. I will be doing this with the grandkids next year. Thanks! I think this idea has to be one of the best for Valentines. Borderline genius! Just posted about it on Craft Gossip! You could use the same idea with homemade tissue flowers or Valentine pencils. Stealing! Stealing! Stealing! Stealing! Thanks for posting and sharing! I am making these right now and am having trouble making the hole! I am trying to use an X-Acto knife, scissors, box cutter, etc. I did one and now the picture is curving. Did you have these problems? Any tips?? Thanks! I just finished mine up. Yours made it to Pinterest, and were my inspiration, so you are getting the credit! I am featuring them on my blog simplyinspiredbymegan.wordpress.com tomorrow if you'd like to take a look. This is our Valentine this year! Thanks for the idea!!!!! What a completely awesome idea!! I'm going to do this with my daughter's photo. She will be very excited to see it. Thanks for sharing! In which I earn the title "Cruelest Mom Ever"